The Isle of Man TT organisers have issued an update on those riders who have sustained injuries at the event this year. Fermanagh’s Lee Johnston, who came off at Greeba Castle on the Padgett’s Supersport Honda, sustained back, tailbone and finger fractures in the incident during practice. He was released from Nobles Hospital on Wednesday and watched some of the racing. Johnston hopes to be fit in time for the Ulster Grand Prix at Dundrod in August. Danny Webb, who – like Johnston – was due to ride in the Lightweight race Ryan Farquhar’s KMR Kawasaki team, has been treated for a dislocated shoulder after coming off in practice at Laurel Bank. Tom Weeden was treated for chest and back injuries after a crash at Brandywell in the Supersport race while Joe Akroyd is receiving treatment for fractures after being moved to Liverpool. Joe Akroyd has gone across for treatment on fractures after crashing at Glentramman in practice. 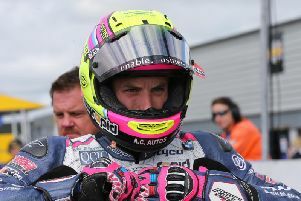 Northern Ireland’s Paul Jordan and Swede Bjorn Gunnarsson were involved in an incident in practice at Sarah’s Cottage but were both discharged from Nobles Hospital and have continued racing.